Soho Ltd. London was a British camera maker from 1929 until 1947. It emerged from the division of APM (Amalgamated Photographic Manufacturers), a merger of seven British companies, including makers of both cameras and photographic media (plates, film and printing papers). APM divided into two parts; Soho included most of the camera-making operations, which were dominated by Kershaw of Leeds. Kershaw were the makers of the highly-successful Soho Reflex range of large-format SLR cameras from which the new company Soho Ltd took its name, though these cameras had been made (originally for sale by the Marion company, which also joined APM and so became part of Soho Ltd) since the early years of the 20th century (Kershaw patented the focal-plane shutter which is their basis in 1904). 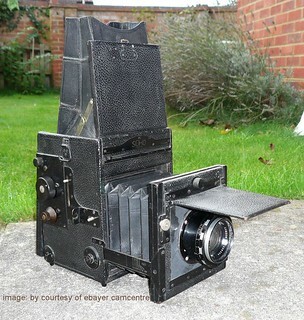 Soho Ltd are also known for Bakelite bodied folding cameras such as the Pilot and the Cadet. These are derived from the Rajar No. 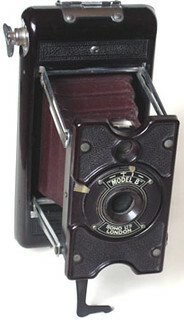 6, a Bakelite-bodied strut-folding popular camera made by APM before its break-up, which pioneered the use of Bakelite. Rajar had been one of the seven companies that merged to form APM, and prior to the merger was concerned mostly with production of photographic media. However, in the division of the company in 1929, its operations remained with the camera-making fraction Soho Ltd. Strangely, Soho Ltd became Kershaw-Soho when the Kershaw family sold the company to the Rank organisation in 1947. By this time, large-format SLR cameras were less popular. Kershaw-Soho produced one more Bakelite folder, the Raven. 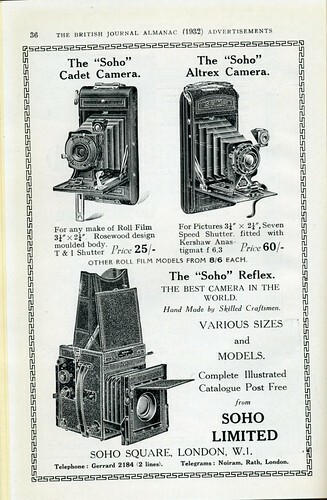 Soho Ltd made both professional, large-format cameras and popular cameras. This page was last edited on 28 August 2017, at 05:49.